The ATT Oracle E-Business Suite interface exchanges information with the Oracle E-Business Suite database. The information that is extracted from the Oracle E-Business Suite is the asset data that can be viewed by navigating to Application->Fixed Assets Manager->Assets->Asset Workbench. 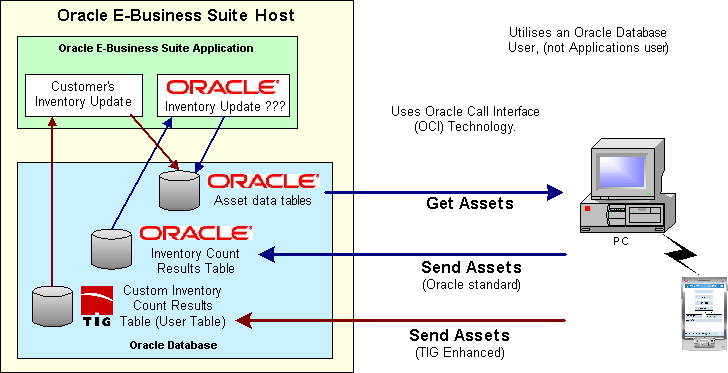 The user must have access to the fixed asset module of Oracle E-Business Suite Applications in order to view this data as illustrated in the diagram. The diagram below displays the components involved in the communication between Oracle E-Business Suite and the ATT software. Data is extracted from the Oracle E-Business Suite based on various aspects and selection criteria. Assets will not be included in the selection if they have a value in the "ineffective date" fields in the Oracle E-Business Suite tables “FA.distribution_history” and “FA.FA_Books”. It uses the Oracle Call Interface (OCI) API to extract information from the underlying Oracle Database. Similarly, it will deliver information to the underlying Oracle Database. There is no communication with the Oracle E-Business Suite Application. As there may be many thousands of assets within a host system, it is not typically desirable that all of the assets be extracted. Usually, only limited sections or types of asset data is required. Therefore, ATT limits the asset selection based on various selection criteria. The information displayed in the three selection windows of the ATT "Get Assets" windows is abbreviated. This is because the full description will not fit within the selection box. The full description of each Book Type, Category and Location, may be viewed in a text file. FA_INVENTORY – The header for the data. FA_INV_INTERFACE – The data from ATT. The date of the inventory count is set to the system date of the transfer PC when the user successfully performs a "Send Assets". The field mapping details between the Oracle host and the ATT data is displayed in the table below.